I had planned on having a post for you today showing off my beautiful handmade mayonnaise flavored with homemade chive vinegar. Um yeah, planned is the important world there. I started a batch of mayonnaise and after adding about one fourth of the vinegar it broke. Sigh. So, I tried again and broke a second at almost the same point. With only on egg left it was time to give up. 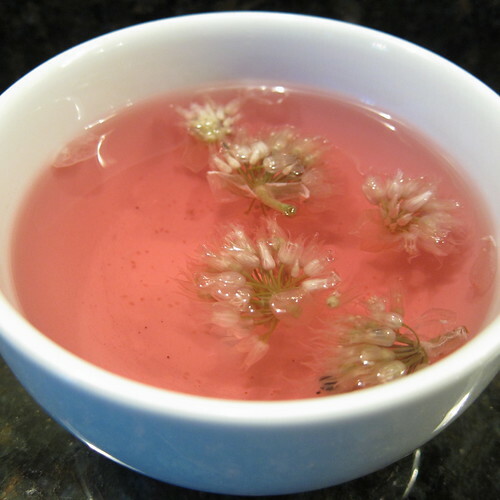 Oh well, I can still show you my pretty pink Chive Blossom Vinegar. I got the idea from Cooking With Anne. I was pulling out a bunch of chive plants that were in bloom, so I threw some together. It couldn't be simpler. I just threw about twelve blossoms into a cup of white vinegar in a sealed container, then let is sit in a cupboard. Anne let her's sit for two weeks, but I let mine go a whole month. When it was time to use it, I strained it through a sieve lined with a paper towel. The result is a vinegar that smells and tastes of chives. It's a really great combo. Since I couldn't use it in homemade mayonnaise like planned, I just mixed it in with some prepared mayonnaise to use on Räksmörgås, a perfect dinner for a hot night. 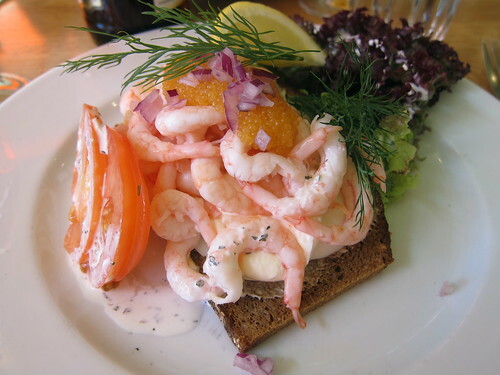 Räksmörgås is a Swedish open-faced sandwich that we saw on every menu on our trip earlier this year. Matt really took a shine to it, so we've started making it at home. So, what is in a Räksmörgås? You start with a dark rye bread (tonight we used Sun Street Breads Wheat Beer Rye and Sunflower Seed). Top that with a very generous smear of mayonnaise. I mixed about half a cup of mayonnaise with the chive blossom vinegar which made a sort of oniony mayo sauce. Then you add a layer of sliced hard boiled eggs. Small, cold cooked shrimp goes on top of the egg. We found the prefect size precooked frozen shrimp at IKEA, all we have to do is thaw some under cold running water and it's ready to use. 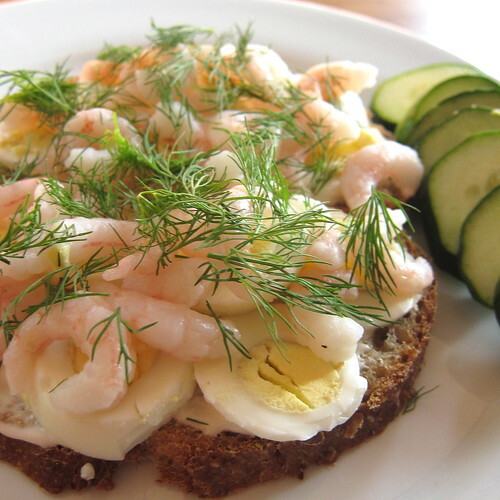 Finally, you add the classic Scandinavian herb, fresh dill. Sometimes the sandwich was served with lettuce, some tomato, or a few slices of cucmber. We also had it topped one day with a little chopped red onion and some roe. So, any other ideas for ways to use my Chive Blossom Vinegar? chive blossom vinegar... interesting. I will have to give it a try in the Spring when my chives are loaded with blossoms. I like trying different vinegars. That vinegar will be brilliant on a German potato salad! Thanks for the chive blossom vinegar idea! I would try it with wilted greens - brown bacon bits, deglaze w/vinegar, plus sugar, pepper, maybe salt and toss the greens into the hot pan until wilted. My favorite use for vinegar by far! I think it was Andreas Vierstad, one of the "Scandinavian Cooking" chefs, who said that about dill. Such a delicious looking sandwich! while the plate you had in stockholm is colorful and lovely, the dish you've prepared yourself is simply pristine. what a gorgeous creation! Your sandwich looks every bit as good as the original! Sorry to hear about the mayo. I remember making it in food science classes, but have never tried it at home. It's a tough one! I'm a bit unoriginal because all I can think of with the vinegar is a salad dressing. Mayo can be frustrating that way -- totally feel for you on that one.